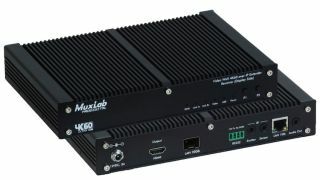 The What: MuxLab has launched the AV-over-IP 4K/60 Uncompressed Extender, Fiber (model 500761), which delivers 4K vide at 60Hz from one or many sources among one or many displays. The What Else: The extender supports both HDMI and DisplayPort inputs for greater compatibility. The systems’ transmitters and receivers can connect to the Switch using OM4 multimode fiber cable, effectively transmitting up to 1300 feet (400 meters) so equipment can be stored far from the installation and accessed remotely. Resolutions up to 4K at 60Hz are supported when using both HDMI and DisplayPort. Uncompressed video can be sent with zero latency at 4K60 (4:2:0); with light compression and visually lossless latency (less than one frame), video is delivered at 4K60 (4:4:4). Both transmitter and receiver come equipped with a 1Gb Ethernet Switch port to connect network devices. RS-232 and IR provide remote control options. A wall-mount bracket kit is included. When paired with MuxLab’s ProDigital Network Controller (model 500811), remote configuration and control of the entire AV-over-IP system is further simplified. Access from any smartphone or tablet is improved via the new MuxControl app. The system is also compatible with traditional third-party control apps.